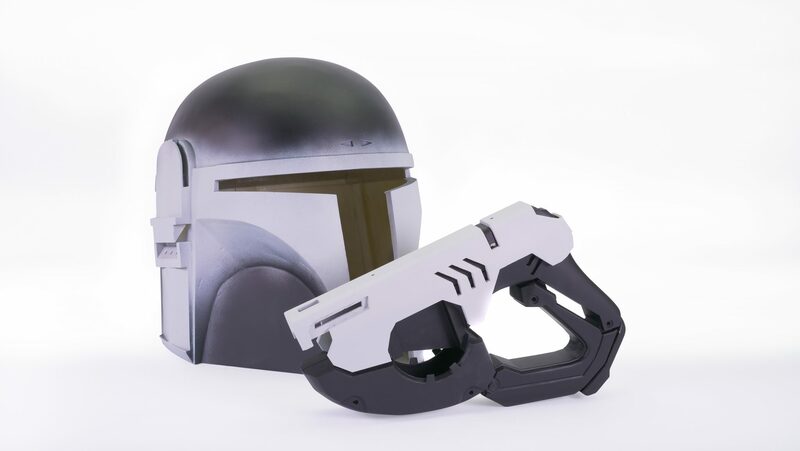 I’m pretty sure that you have thought at least once that you would love to have a replica of a certain weapon or armor from your favorite game, movie or TV series – something cool to put on display. Or perhaps you want to get into the increasingly popular hobby, cosplay. Perhaps you don’t want an expensive and pre-made item from a shop. You want something that YOU created. And that is why we are here to show you how the Original Prusa i3 MK3 (or any other 3D printer) and several other tools can be used to create an amazing model. 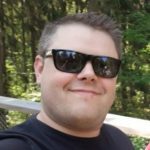 The process of machining 3D prints is called postprocessing, and today, I want to show you all of its secrets. Once you master these techniques, you will be able to work with pretty much anything you print. Recently, we have looked at what postprocessing is about, but only in general terms. Today, we will describe the whole process step-by-step. 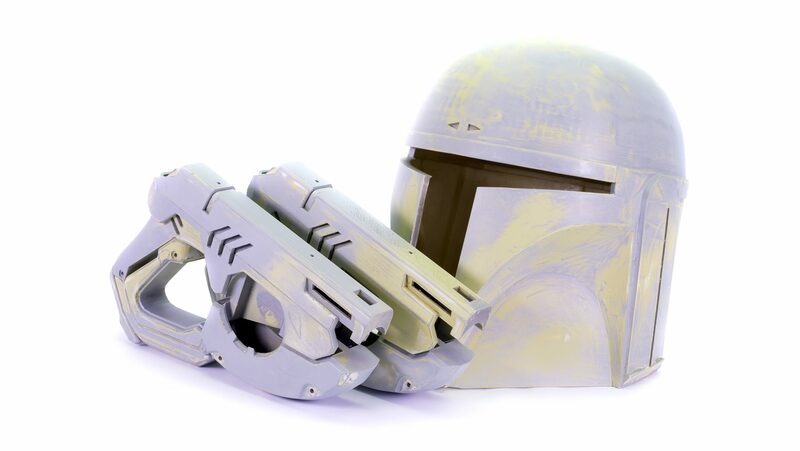 We will transform grey 3D printed models into beautiful replicas of your favorite game or movie props. First of all, we need to decide which filament to use. We are mainly interested in how well we can work with various materials and how you can achieve the best possible result while remaining efficient. 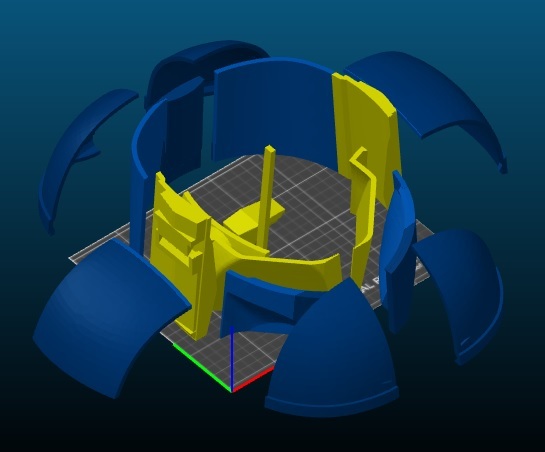 First chapters of material guides usually mention two materials – PLA and ABS. 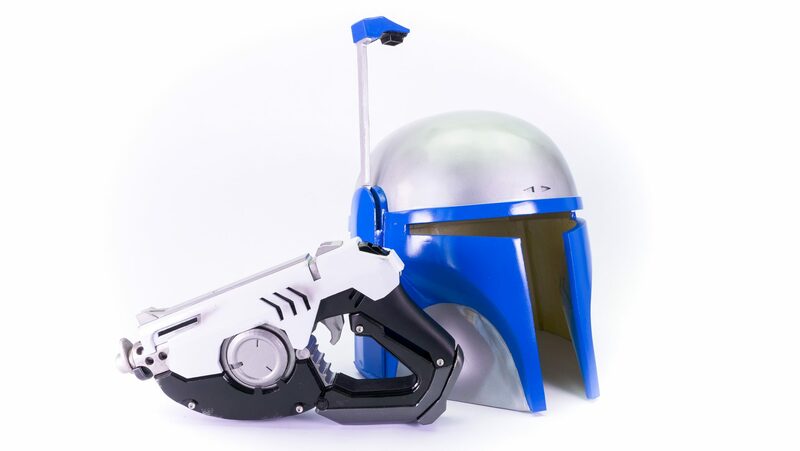 The very popular PLA is ideal for 3D prints for which aesthetics are important. Thanks to a lower printing temperature, it is easier to print and also, it’s suitable for producing finer details. 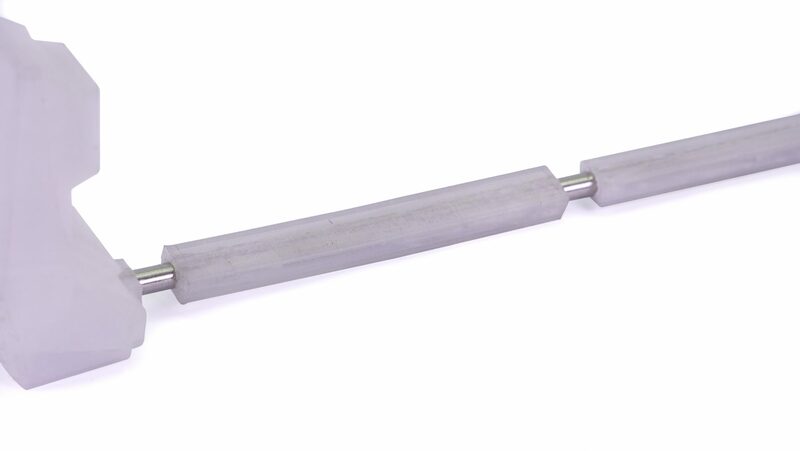 ABS is more suitable for applications where strength, ductility, machinability and thermal stability are required. However, it is more prone to warping and it’s not very easy to print. That’s why we’re choosing PET-G instead of ABS because this material guarantees the same durability as ABS, but it’s not so prone to twisting, warping or cracking. Another advantage is that PET-G does not have an unpleasant odor like ABS. As far as filament colors are concerned, the choice is yours. You will most probably paint the model, so the color of the filament is not important at all. For postprocessing, I selected two models, one for each material, and I’ll take you all the way to the final result. 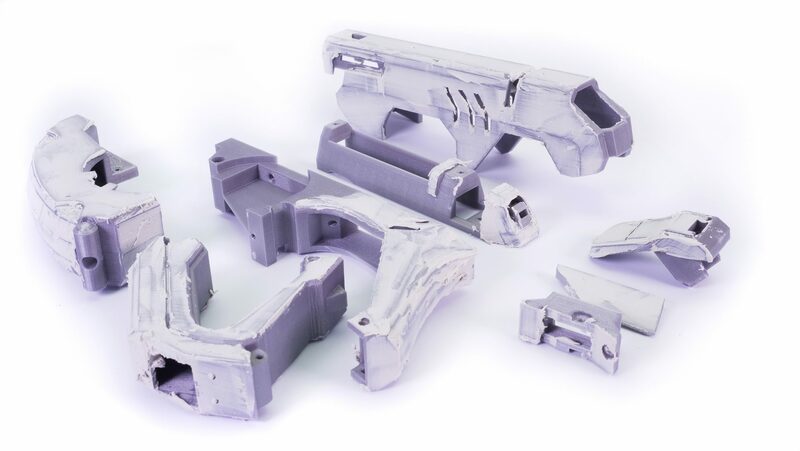 From PLA, we will produce Tracer Guns from Overwatch because they are quite detailed and the vast majority of parts will be hand-processed. 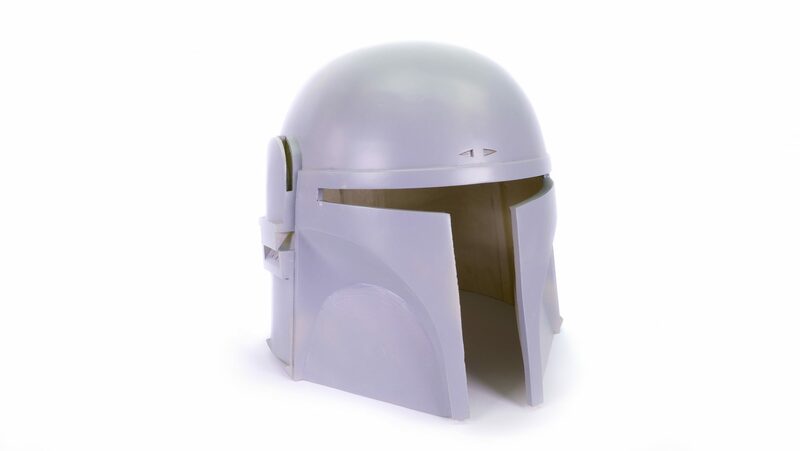 And every loyal Star Wars fan should have a Mandalorian helmet at home. 🙂 We will print it from PETG. 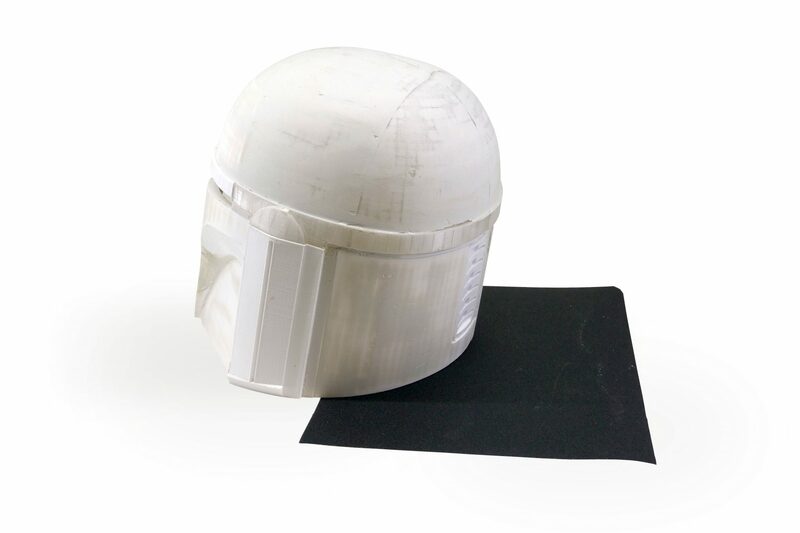 The helmet has simpler shapes, so we can smooth it with a sander. To do that, we need a material with higher temperature resistance – hence PET-G. When you print a model you want to postprocess further, it matters very little how many supports and what settings you use. Also, the layer height doesn’t make much of a difference. Essentially, just use the optimal factory settings for the printer to get the results you need. Use infill of 20% or higher, as objects will be stressed during processing. Okay, we have the prints ready, so now it’s time to glue the parts together and prepare them for grinding. The printed model should first be temporarily assembled (ordinary adhesive tape is ok) to see what’s ahead of us. This applies to painting, too. 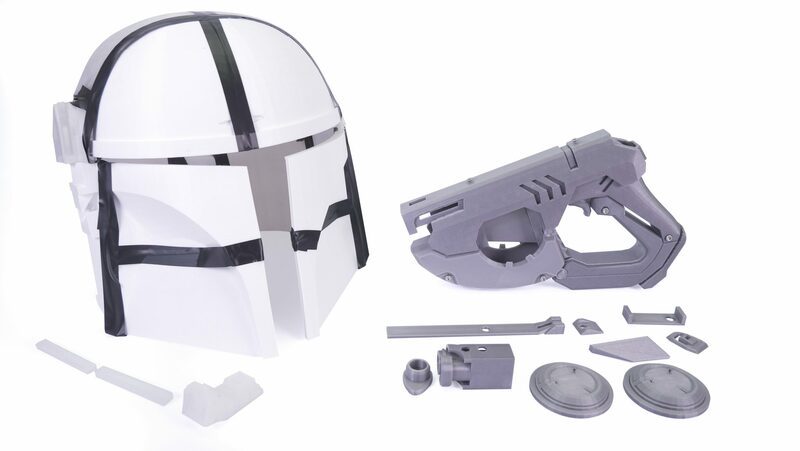 If we have the possibility to have each part painted with a different color separately, we can save ourselves a lot of trouble – like masking various parts of the model so that the spray paint does not affect already painted parts. Once we know how the model will look, and we know which parts will have to be glued together, we can finally use the proper glue. I personally recommend using glue with an activator, either fix or spray. If you don’t have that, any better Superglue should be enough to ensure a strong bond. 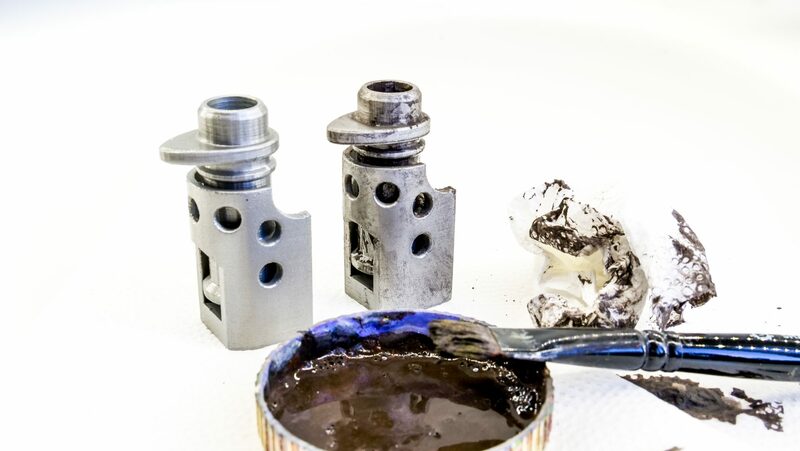 During gluing, it may happen that we encounter parts that will be more stressed. To achieve a better toughness, we can reinforce the stressed parts to prevent them from breaking. The best practice is to use metal profiles and drill small holes in the plastic where we can insert the profiles. You can use various screws, pipes or wires, skewers or plastic boards as a reinforcement profile, or pretty much any materials/objects that fit the particular model and improve the strength of the stressed part. For example, the antenna required reinforcing, because this part was too thin and susceptible to fracturing. I fixed that by drilling a small hole and inserting a steel rod in it. Large and thin surfaces can be reinforced with a polyester resin that improves the structural strength of the whole model. Add a hardener to the mixture according to the manufacturer’s instructions. It’s better to prepare smaller amounts that you will actually use up. 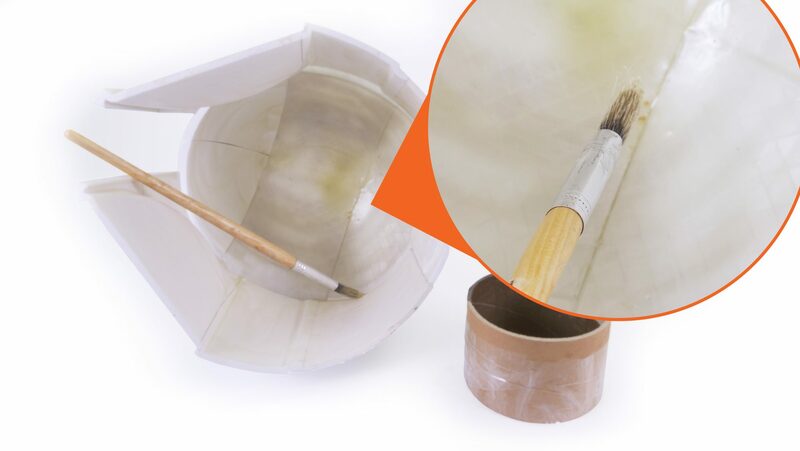 Mix the resin in a bowl with a brush (keep in mind that the bowl and the paintbrush will be unusable after this procedure). Then, apply the mixture into the inside of the model with a brush. If you still find the model fragile, use a fiberglass cloth, which you will press into an already applied polyester resin layer and then apply another layer on top of it. 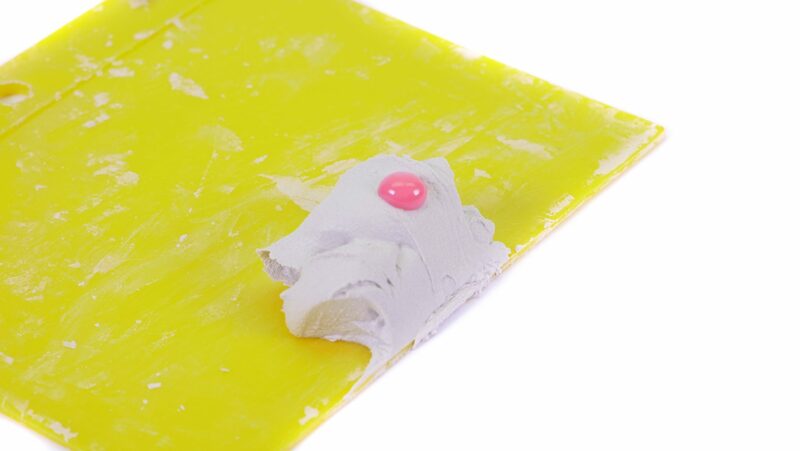 If there are any sharp corners on the model, simply sand them with a P100-grit sanding paper so that the surface is smooth and any potential injury during manipulation/wearing is avoided. The resin should be applied in a well-ventilated room or outdoors, but preferably at temperatures above 20 ° C.
Now we have the models ready for the next step – hiding gaps between parts and sanding. 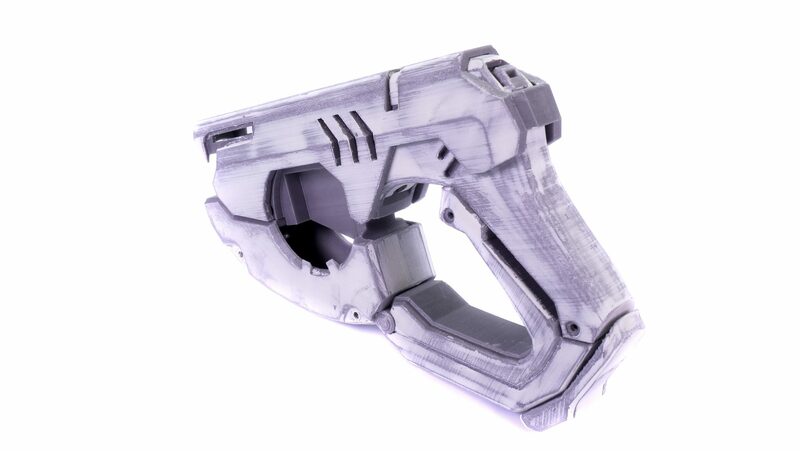 First, let’s do a rough sanding of the printed object to find out whether we need to add extra material to hide the gaps between different parts. It is also the first step in the process of creating a nice smooth surface. Personally, I prefer the P100-grit sandpaper for this task. Be careful, however, not to make unnecessarily large scratches or gaps in the print, which would require extra fixes afterward. On the other hand, if you just grind through the surface into the infill, don’t throw the part away. You can easily hide it with a putty. Once the model has been roughly sanded, we can move to fill the gaps between single parts. I recommend using body filler used in the automotive industry. Apply a thin layer on the gaps and let it dry. Once the model has dried, polish it with P100 sandpaper. Keep repeating this procedure until the gaps are not visible. Once the model is ready, we can apply a layer of putty/body filler onto the rest of the model, and then sand it with a P100 sandpaper. And we basically repeat this step over and over (and over) until the model is beautifully smooth. 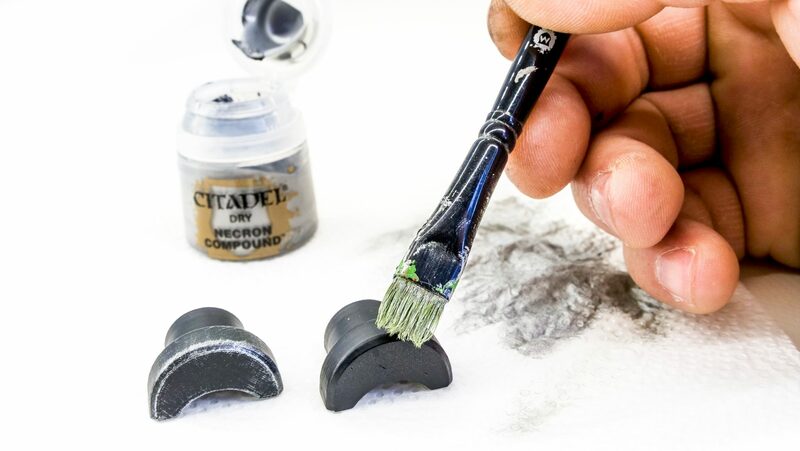 Between each round of application and sanding of body filler, it is a good practice to spray the model with a filler in a spray that will highlight contours between layers, so we can instantly see whether there is some kind of bulge or defect. Use the spray from a distance of approx. 20 cm (8-10 in.) at an angle of about 15 °, this applies to base colors or colorless varnishes as well. Use smooth long strokes and spray the model from one end to the other without staying in one place for too long. This will avoid accumulation of drops of paint. Use a marker to mark areas that have visible inconsistencies and require more care in the next round of sanding/smoothing/painting. You do not have to worry that alcohol-based markers will be visible through the base color and multiple layers of the filler. When the model is finally dry, you will easily mask these marks with the first proper color layer. Once we have sanded everything to achieve the best possible look, the model needs to be sprayed with a base paint and then finished with a very fine P400-grit sandpaper to achieve a completely smooth surface, which is ready for applying the last layer of base paint. 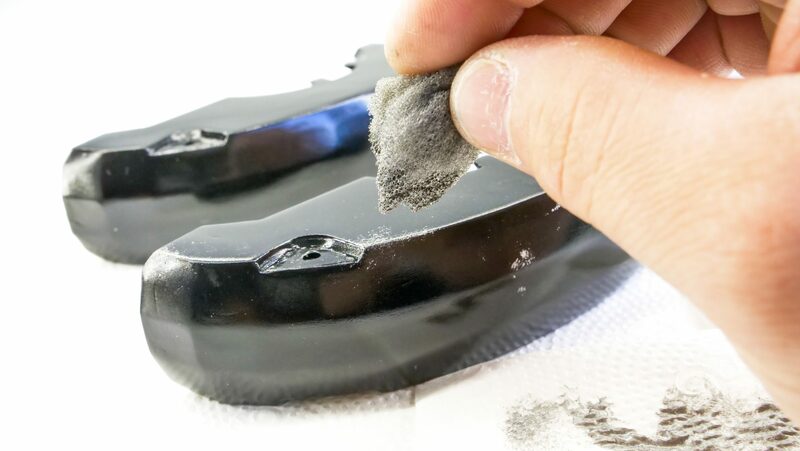 If you feel that the surface is still not smooth enough, you can spray the model with a filler or basecoat again and then sand it with P400 sandpaper – either using dry or wet sanding methods. Now we have the base paint applied, so we can finally move onto other colors. The best way to apply the paint is to start from the least accessible places or from the largest areas. 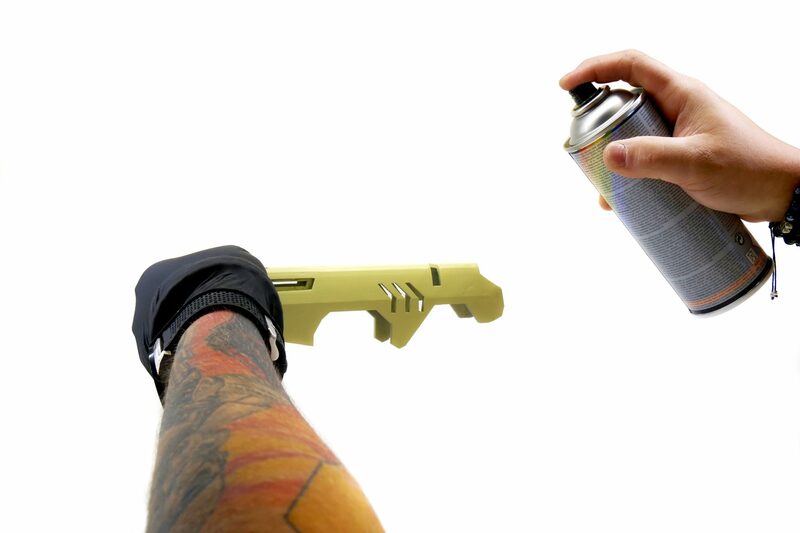 A good practice is to fix every layer of paint in place using a clear coat spray (glossy or matte) to preserve the layer and prevent any damage to it (such as smudging) during subsequent work. Then you can proceed with applying other colors either with a brush, airbrush or spray. If you use a brush, keep in mind to mix the color with enough water to avoid visible brush strokes on the surface of the object. Apply multiple layers to achieve proper coverage. The color will be beautifully saturated and the brush marks will not be visible. If you apply paint using a spray or airbrush, you may need to use a paper adhesive tape to mask already sprayed surfaces. With regard to color selection: brands like Vallejo, Citadel or Model Air will offer you a huge range of shades. Maybe you already have your favorite brands, but I know from my own experience that it’s good to do a bit of experimenting from time to time and discover new products. Once we have all the colors applied, we can switch to so-called washing, chipping and drybrushing techniques. Chipping is a technique useful for achieving a damaged surface look. You will need a piece of sponge for this. Soak the foam into the paint, then wipe it into a napkin and start tapping the object lightly with the sponge. (see photo below). This way you can create the effect of weathered/scratched metal for example. Washing or weathering is a technique for reproducing a weathered look of a surface. It consists of applying heavily diluted paint onto a model with a soft brush. The color is then wiped with a paper napkin in such a way that the residual color creates the “depth” of the model and highlights edges or lines. Applying this color to a larger surface helps to make an object look old or heavily used. Drybrushing is a technique to highlight the edges of an object. Use a flat brush to pick a color of your choice, then wipe it into a napkin and leave only a small amount of paint on the brush. We use roughly ⅓ of the bristles and move them with a quick movement from one side of the model to the other. The slope should be 90°. This technique ensures that all the edges of the model and details are highlighted. Finally, fix the last applied color layer of the model with a colorless varnish in spray – shiny or matte, depending on what type of effect you want to achieve. This prevents damage to the color during further manipulation. And what about the costs? To be honest, it’s pretty hard to give you an exact calculation, because you rarely get the color or body filler in the exact amount for only one model. 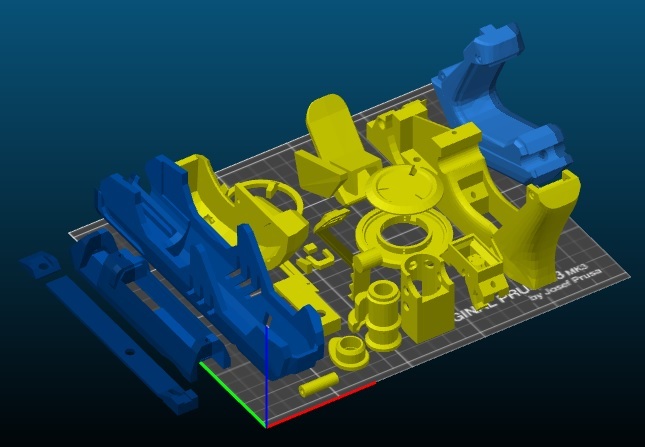 The total cost of postprocessing of one model is roughly 16 USD, but we do not include the costs of colors, because their use can vary a lot, depending on the project. The above mentioned amount includes sanding paper, varnish, base spray, and filler. But you will definitely be able to use these items on more than just one model, so the 16 USD price is calculated proportionally. Postprocessing is, first and foremost, time-consuming. You should prepare for the eventuality that you will play around with bigger models for even more than 15 hours. 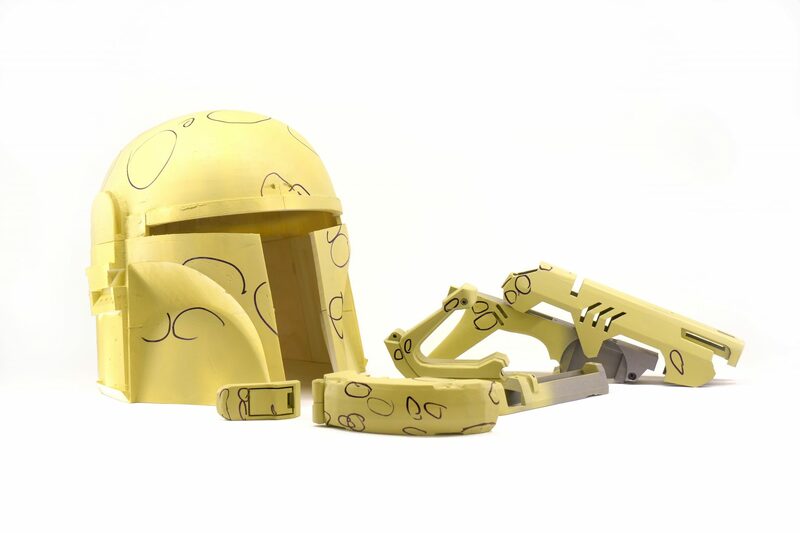 For an experienced modeler, the helmet was a job that required over 8 hours of work, not including drying, curing or printing parts. A beginner is likely to need more than twice the time. The Tracer guns are a bit easier to work with because the model consists of several parts that can be postprocessed separately. Still, it required over 10 hours of work, not counting curing, drying and printing the model. Beginners can potentially spend up to 18 hours of work here. Sounds like pretty scary numbers, but be patient 🙂 The results are worth it. A huge advantage is that if you accidentally damage the model, you can easily print another one. So don’t worry about something like “I’m clumsy, I would ruin it”. With a 3D printer, you can always try again. What an outstanding article. Thank you for the work in preparing and posting this. very informative! PETG is a great material to work with but it has issues when I try to bridge anything. I prefer to print in PETG because it doesn’t warp and generally keeps it’s dimensional accuracy unlike ABS. My question is when we are working on models, will the putty cover up fine details?